Jefferson Bleu Raeders Drum and Bugle Corps has proven to the rest of the country that it is not to be taken lightly. In a two week period, the corps won three first place awards in Illinois, took third in Iowa and placed second, fifth and ninth in Wisconsin. 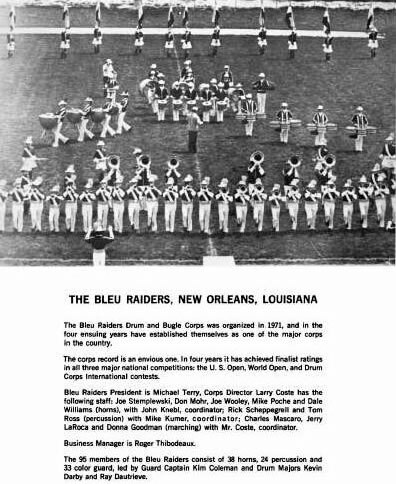 The corps left New Orleans June 28 for competitions in the mid-west with the top corps in the country. The Raeders placed second to the former national champion Racine Kelties Corps in their first contest in Oshkosh, Wisconsin, June 30. The next night the Raeders competed in Dubuque, Iowa, and took third. Raeder members felt their first taste of victory in Dixon, Illinois, July 2 when they won the “Petunia Festival Championship”. There, they received a traveling championship flag. The next night in Racine, Wisconsin, Raeders got cold feet—the temperature was in the forties—and managed only a fifth place. Schedule consisted of sleeping, eating and practicing which no one minded. And it was well worth it. The Raeders placed ninth in the first national championship in which they entered. There are few corps in the country who claim this accomplishment. The corps’ last performance on the trip was the best one. Though this is when the members should have been the most exhausted, the Raeders performed the most spirited and exciting shows of their tour and their score proved it, when they defeated their nearest rival by more than three points. Thus within ten days the Raeders earned more than $4,000 in prize money, invitations to at least five more contest for this season and a nationally recognized name. On July 31, the Raeders will leave again for competition. This time they will take in both the east coast and Midwest for several national championship shows.